EZ Bobs Intarsia Bobbins are a very convenient way to store smaller amounts of yarn for knitting intarsia. 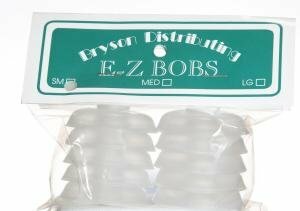 The 3 1/2" diameter large EZ Bobs bobbins are made of a soft plastic shell with a firmer plastic back. To use the bobbins, you peal back the soft shell. You can now wind yarn on the EZ Bobs until you have filled the bobbin. You can add what ever amount you want. When done, push the soft shell on the EZ Bobs down again remembering to hold the end of the yarn outside the shell. EZ Bobs are constructed so they hold onto the yarn, but only enough to keep it from slipping out. As you pull the EZ Bobs down from your knitting, more yarn is released. You can keep the tails short without too much tangling. It's easy to undo any tangles just by holding up the knitting and rearranging the EZ Bobs. You usually only need one hand. EZ Bobs bobbins are not only for intarsia. You can store narrow ribbon, ravel cord, string, wire or anything that can be wound around it. EZ Bobs are a great product with loads of uses.